Please note: Only productions highlighted in pale yellow were part of the Season Tickets package. This long running Off-Broadway absurdist comedy places Albert Einstein and Pablo Picasso in a Parisian cafe in 1904, just before the renowned scientist transformed physics with his theory of relativity and the celebrated painter set the art world afire with cubism. 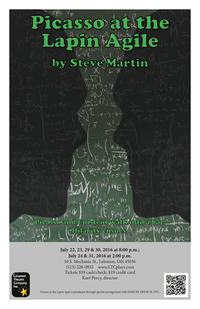 In his first comedy for the stage, Steve Martin plays fast and loose with fact, fame and fortune as these two geniuses muse on the century's achievements and prospects as well as other fanciful topics with infectious dizziness. Bystanders, including Picasso' agent, the bartender and his mistress, Picasso's date, an elderly philosopher, Charles Dabernow Schmendimen, and an idiot inventor introduce additional flourishes of humor. The final surprise patron to join the merriment at the Lapin Agile is a charismatic dark haired singer time warped in from a later era. This production is the first in LTCs annual Summer Theatre series, designed to provide performance opportunities to our area's young adult performers ages 16-25. We hope to showcase some of the best young talent from around the region while giving students the chance to develop their theatrical skills and perform for the broader community. 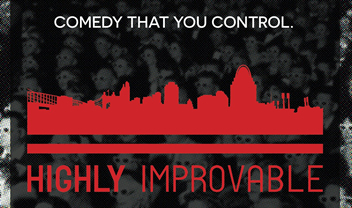 The Highly Improvable Improv troupe returns for another evening of improvisational hilarity. ​In this hilarious Christmas classic, a couple struggling to put on a church Christmas pageant is faced with casting the Herdman kids–probably the most inventively awful kids in history. You won't believe the mayhem - and the fun - when the Herdmans collide with the Christmas story head on! This delightful comedy is adapted from the best-selling Young Adult book, and has become a holiday staple for groups across the United States! Features plenty of great roles for children and adults, a few favorite Christmas Carols, and a lot of laughs! Our 13th Annual Gala Fundraiser will be held Friday and Saturday, January 20 and 21, 2017. This season's theme is "Everything's Coming Up Music." Tickets are $75/person. The evening includes appetizers and dinner at The Golden Lamb, followed by a celebration of music at our Mechanic Street Playhouse, and catered desserts at intermission. 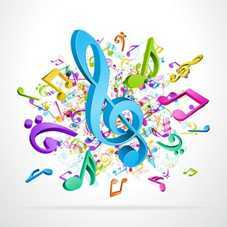 ​This is your opportunity to enjoy an exciting evening of food, fun and music. It is also a way for you to help keep the Arts alive in our community while supporting the Lebanon Theatre Company. ​Produced by special arrangement with Dramatist Play Service, Inc.
​Unable to sleep, Elaine Wheeler paces the living room of her Manhattan townhouse, troubled by unsettling memories and vague fears. Her husband tries to comfort her, but when he steps away Elaine sees (or believes she sees) the body of a dead man in the window across the way. The police are called, but find nothing. Elaine’s terror grows as she sees still another body—this time a woman’s—but by now the police are skeptical and pay no heed to her frantic pleas. Her husband, claiming that Elaine may be on the verge of a breakdown, calls in a psychiatrist, who agrees with his suggestion that Elaine should commit herself to a sanitarium for treatment. Elaine’s old friend and house guest Blanche; the inquisitive and rather sinister man who lives next door; and the nosy German maid Helga—all contribute to the deepening suspense and mystery of the play as it draws towards its riveting and chilling climax. 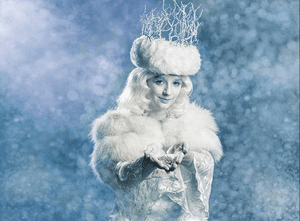 In Narnia — a land of talking animals, mythical creatures and eternal winter — the White Witch holds power over all. Any who dare dissent are turned instantly into stone. But one day, a little girl named Lucy enters this magical land through an enchanted wardrobe, and her fantastical adventure signals the fulfillment of a prophecy and great change to come. Step through the wardrobe with Lucy, Peter, Susan and Edmund in this tour-de-force, two-actor adaptation of the beloved and heroic tale of good’s triumph over evil. In 2002, Lebanon celebrated its Bicentennial. In honor of the event, LTC applied for and received a grant from the Fine Arts Fund to commission a play about the women who contributed to Lebanon’s history. Former LTC board member and accomplished writer Jill Davis researched and wrote an original play called Leading Ladies of Lebanon, which was produced to standing room only crowds over the 2002 Labor Day weekend. 2017 brings not just a repeat of Leading Ladies of Lebanon, but a revival. This newly refreshed tale of Lebanon’s most inspiring women brings drama, humor, history, and beauty to the stage, offering a fascinating take of our city’s origins.